Been away for a few days R&R with family, when up popped a truly sad Tweet from pianist Vijay Iyer, reporting on the passing on to ancestry of my favorite performance poet, Jayne Cortez. Mother of drummer Denardo Coleman (son of the legendary Ornette), and recording artist with an impressive series of recordings of her work on her own Bola label, Jayne’s work is truly extraordinary. Blessed with an ability to deliver biting social commentary in an ironic and often good humored tone, I’ve been delighted to meet and converse with Jayne in recent years through our mutual friend, and my mentor, Randy Weston. Randy and Jayne’s friendship and mutual admiration society crested last Easter Sunday during a matinee premier of Randy’s “Nubian Suite” at NYU. For that work, hopefully soon-to-be-released on record, Randy crafted two large ensemble pieces sandwiched around a series of storytelling duets. One of his duet partners was Jayne Cortez and their collaboration was a true highlight on a program filled with high moments. The next day Randy’s wife Fatou threw him a belated birthday party at their home and Jayne and her husband-sculptor Mel were among the celebrants. Randy recounted their collaboration on the concert, marveling at how though he had asked Jayne for a look at her poem in advance, she had coyly refused, desiring instead that he purely improvise to her verse. The results were pure magic! 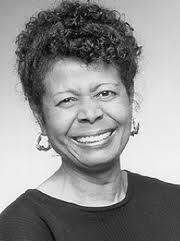 Peace be unto you Jayne Cortez, and thanks for those precious memories and for the lasting legacy of your rich discography. thank you so much, Willard, for sharing this tribute and remembrance to such a special person. First time on this site in a long time & the first thing I see is the notice of the passing of Jayne Cortez. I have been a follower of her work since Celebrations & Solitudes with bassist Richard Davis on the Strata- East label back in 1974. I tried to pick up her books & other recordings since that time. Her voice will be missed. You gone home, thank you for your gift, will miss you ….